i love anthropologie. i really do. a couple summers ago i happened to be in west edmonton mall and got very excited about the opportunity to shop there (and j was tres patient, thank goodness). however. i cannot for the life of me understand their pricing schemes - some product prices are disturbingly high and others are ridiculously low. the problem is that i have trouble spending money on the higher priced pieces when i cannot see a discernible difference between them, and the lower priced items. this issue is particularly evident in the jewelry department. so let's play a game. each of the necklaces below have been divided into similar pairs. you have to guess which one has the high price and which one is lower. 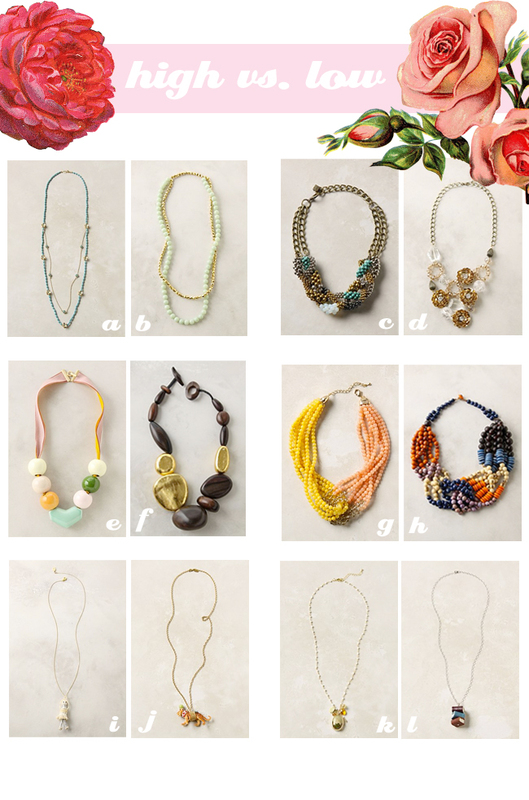 Haha so interesting - I think anthropologie is insanely overpriced for what you get, jewelry or otherwise. I think the i/j pairing is what shocked me the most. SOOOO interesting!!! I have a habit of looking at items and automatically choosing the higher priced one. Not sure why. Guess I have expensive taste?? haha! Haha - it's funny, I actually prefer the cheaper ones!! I wonder what that says about me? Yeah...they do have some nice pieces, but the prices are insane. I remade two necklaces on my blog from them - one for $88 and one for $428 - which is just ridiculous - More than my car note... check them out if you get a chance! Would love your opinion on them!